(MENAFN - The Conversation) Worldwide honeybee populations are in peril – and it's a dire situation for humans. Threats from climate change , toxic pesticides , and disease have all contributed to a steep honeybee population decline since 2006. And as a third of the food we eat is a direct result of insect pollination – including by honeybees – there could be serious consequences for us if the species goes extinct. We recently uncovered more about a well-known, important honeybee signal known as the dorso-ventral abdominal vibration (DVAV) signal . Known as the honeybee 'wake-up call,' this signal tells other bees to prepare for an increase in work load, particularly in relation to foraging . We developed a remote sensor which allowed us to monitor honeybee colonies without opening the hive. By understanding the frequency and strength of the DVAV signal in the hive, beekeepers and researchers might be better able to monitor the health of bee colonies worldwide. Problems can arise quickly in a colony, with devastating effects. While commercial beekeepers are doing their best to monitor bee populations in hives, checking on every single hive's population is a near impossible task, as some professionals have more than 1,000 colonies to care for. Using an accelerometer sensor (which measures the rate of acceleration the bee's body vibrates) with automated recording software, we were able to continuously monitor activity in the honeybee hive. Our research found that we can pick up the DVAV signal in the hive when honeybees pass near our sensor. Knowing this allows us to refine our assessment of the health of the colony, as specific health disorders will be reflected in changes in the hive's overall DVAV activity levels. This 'wake-up call' was not previously known to produce any vibration within the honeycomb, but we now have recorded the associated waveform in outstanding detail. Additional video analysis allowed us to confirm that it was the DVAV signal our sensor was detecting. From this, we were then able to create further machine-learning software to automatically detect and log any occurrence of DVAVs from the data our sensor picked up. This, alongside other research , suggests the DVAV signal may not function only as a wake-up call. For instance, this signal might be a way for bees to probe the contents of the honeycomb in order to check the honey and pollen storage levels, or for the presence of eggs. The amplitude of the signal, which varies a lot between night and day, might indicate the context in which the message is being produced. Its nighttime enhanced frequency is both a new discovery and, presently, an amazing mystery. This new insight into the DVAV signal will help scientists recreate it so that we can try to communicate with the bees. By driving a precise replica of DVAV signal waves into the honeycomb (something not possible before our study), researchers will be able to transmit meaningful messages to the colony. This will let them check that enhanced colony activity is achieved, and will also allow them to further understand the DVAV signal's specific functions. 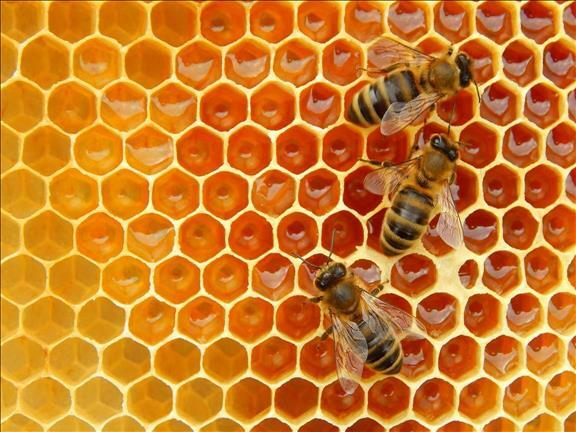 Our new research builds upon the work done by Karl von Frisch who decoded the meaning of the honeybee 'waggle dance' . Von Frisch discovered honeybees use it to alert each other of nectar in the area, and it gives highly precise instructions on where to find it. The waggle dance is still discussed today as an example of astonishing sophistication in insect communication. The discovery also prompted a shift in our thinking about other life forms, and how they impact our lives. With the current evidence we have about humanity's detrimental effect on Earth, it is likely that society's impact on the planet will only get worse. Despite our desire to protect endangered species, we frequently make decisions for humanity's benefit which are damaging to the environment. By highlighting another fascinating element of honeybee communication, we hope that our work will help shift humanity's thinking and make sustainability of the planet the top priority.